I like when I can watch something and it makes me think a bit more about something that I wouldn’t normally spend my time focusing on. “Death Parade” is based around what happens to us after we die. Arbitrators exist solely to cast judgement on the souls that pass through their bars; they judge them by having them play various games and then send them either into the void or to reincarnate. At the start of the season, it made me ponder over where we went, if heaven and hell exist, etc, but by the end, my thoughts delved so much deeper. This show made me think about what it means to be human. Of course, I will probably never know the true meaning behind our existence, but this show continually attempted to define us, the human race and gave a glimpse of how we tick especially in the face of death. How people begin to grasp on to every last string of life that they have before their last breaths. It’s almost like when we have near death experiences and suddenly cherish our life more, but with higher stakes. Each person comes in with no recollection of their deaths. In their minds, they’re still alive and this person making them play a game with their life on the line is relatively insane and devoid of emotion (but makes a mean cocktail). So as they fight “for their lives,” they catch glimpses of their lives up until the moment they died. And usually, this is the last moment of judgement. How will they act when they realize all they’re playing for is a spot in what they believe is heaven or hell? Will they continue to try to crush the other player or will they repent? Will they kill them again or will they help them in times of need? And with all of these loose ends comes the last question – how will Decim judge them? The intriguing part of this show was the partnership presented between Kurokami no Onna and Decim. 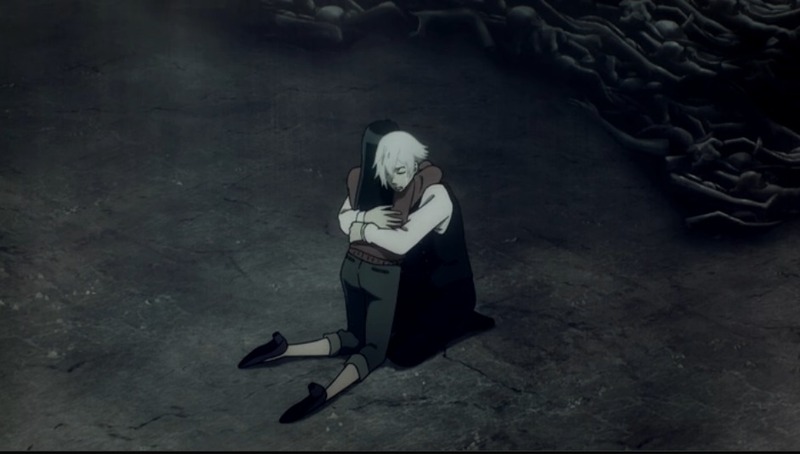 Kurokami shows her emotions openly and assists Decim in his judgements, eventually making them more just and making them a lesson in human emotion. I don’t want to spoil any part of the show, but I will say this: the way Kurokami and Decim’s dynamic unfolds is so beautiful and I’ll admit I cried episode 10. And again in episode 12. And my heart hurt during episode 11. I also cherished the top screenshot for a week. All in all, I was a mess. But this show is definitely worth a watch. Still, 8 months after finishing, I still consider it one of the best animes I’ve seen.